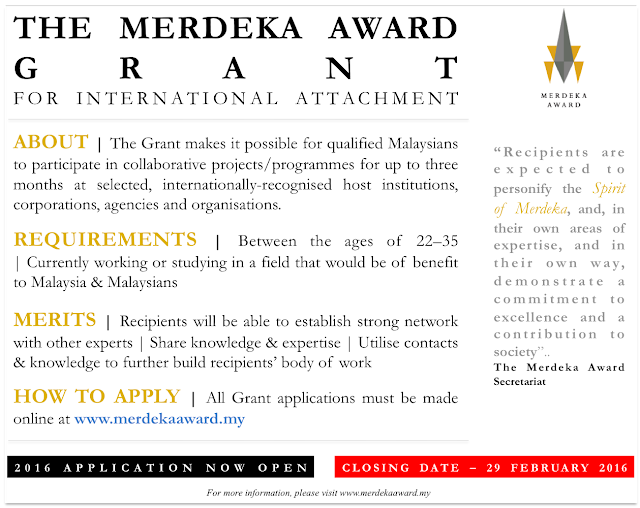 The Merdeka Award Secretariat is pleased to announce that the closing date for applications for the 2016 Merdeka Award Grant for International Attachment has been extended to Monday, February 29, 2016. This follows calls from institutions of higher learning as well as prospective applicants, who have requested for the extension to accommodate research and exam schedules. The extension will allow for more young Malaysians to submit their applications for this prestigious Grant. The Merdeka Award Grant for International Attachment is a signature outreach programme of the Merdeka Award Trust. It is designed to identify and recognise outstanding young Malaysians, between the ages of 22 – 35, who personify the Spirit of Merdeka, and those who, in their own way, demonstrate a commitment to excellence. The Grant provides them the opportunity to expand their network and to enhance research collaborations through a short-term attachment at selected, internationally-recognised host institutions. For more information on the Merdeka Award Grant for International Attachment, and to submit applications, please visit Malaysia Scholarships 2016. Closing date for applications is February 29, 2016.